I’m helping Jessica Spring at Pacific Lutheran University with their newly acquired Thorniley Collection of type. 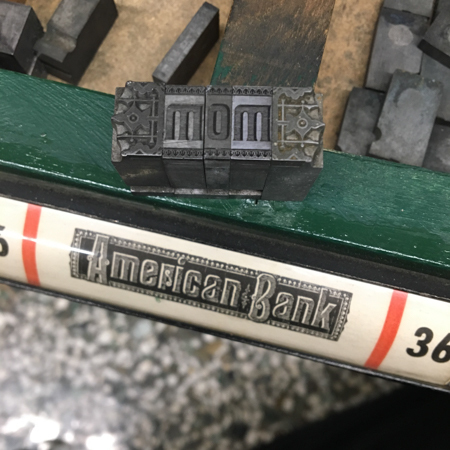 This font has a case label that says “American Bank” but I haven’t been able to confirm it with my usual sources. It’s a 36pt metal streamer font. Label shown was printed with the type. The end caps shown in the one photo may not be part of the actual font, so ignore those. 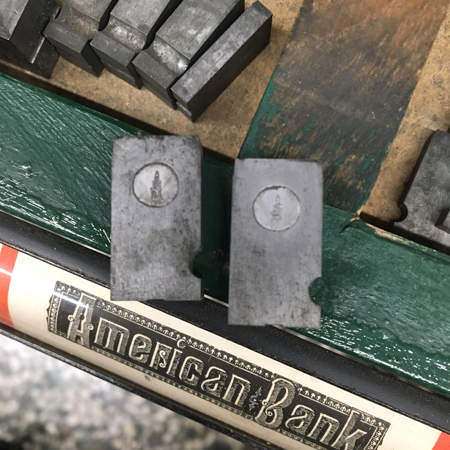 Does anyone recognize this type or pinmark? “American Bank Note,” by John G. Mengel & Co., “Monumental Type Foundry.” Advertised in the June 1885 Inland Printer; ad reproduced on p. 56 of Annenberg’s Typographical Journey through the Inland Printer. I’ll post an image of the showing shortly. Here (I hope, if it shows up) is tiny version of a scan of the June 1885 showing of Mengel/Monumental’s “American Bank Note,” done from the original Inland Printer (not Annenberg’s reprint of the page). With apologies to future readers of this thread, right now that image is only up in temporary space and will disappear. Also (with apologies) when I scanned it I was still scanning greyscale, having not yet come to realize that all printing is color printing because no ink is truly black and no paper truly white. It’s a 16 Meg PNG format image. And, yes, a Mengel/Monumental TF pinmark would be a splendid addition! BTW, there is no relationship between this 19th c. “Monumental T. F.” and Bob Magill’s Monumental Press and Typefoundry (which is now conducting its typefounding operations as Sterling T.F.) 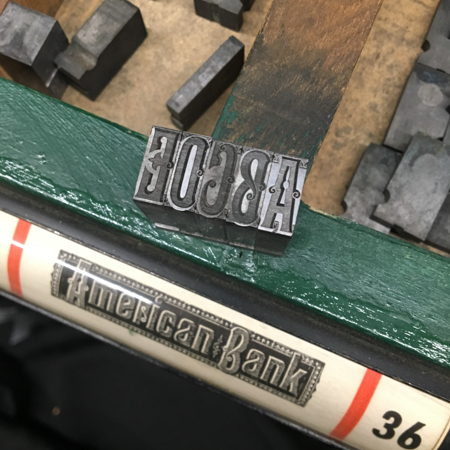 Bob named his Monumental Press and Typefoundry after the name of his first printing press. Lasko’s article on pinmarks in the short-lived journal Festina Lente shows two pinmarks for Mengel/Monumental, but they are both large stylized versions of the letter ‘M’, not the “stacked” version you have here. So your pinmark is an addition to the literature. Mengel/Monumental was one of four Baltimore foundries which were a part of the original formation of ATF in early 1892. The other three were John Ryan & Co. (which was the biggest of them), Charles J. Cary & Co., and Hooper, Wilson & Co. The early ATF corporate annual reports list various consolidations of the foundries, but make no mention of nine of them which were shut down almost immediately (by July 1893). Mengel/Monumental was one of those nine. The Ryan foundry was the largest in Baltimore, and it became the ATF Baltimore branch / manufacturing foundry before the later consolidation into the Central Plant in NJ in the first years of the 20th century. I just yesterday ordered the Annenburg book you mentioned (thanks to you recommending it in another post in this discussion group). It sounds like an enjoyable as well as resourceful book. I really like seeing how these typefaces were introduced to the market. And hey… those end caps are original. Nice! Lastly David, will work on getting a proper photo of that pin mark to you. 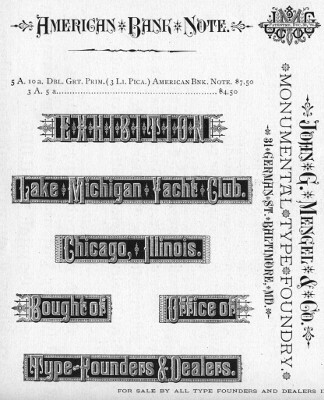 First of all, the “end caps” shown in your photo do belong to the American Bank Note font.They are shown in the John G. Mengel & Co. ad shown in th June 1885 issue of the Inland Printer. This ad also states that this face was patented by the Mengel Co. on December 30, 1884. This may help to explain the ATF annotation. I’m just guessing here, but it might be that the pinmark shown above might be an attempt to represent the monument that gave the foundry its name. Baltimore was the first city to erect a monument to Washington, and was given the sobriquet “The Monumental City” as a result - and that’s why the Mengel foundry took the same name. That is gorgeous and needs a complete, high-quality specimen very carefully printed of it. This could be scanned for storage on sites like David’s or the Internet Archive to record it for posterity and give the possibility of a revival some day. If you print it, I’ll happily scan it and pay shipping costs.